Law students frequently ask which upper-class courses they should take if they are interested in pursuing a specific area of the law. The Office of Student Life has broken down the curriculum into several subject areas and created lists of all the courses currently or recently offered. Many courses fall into more than one subject area. We have included in each subject area not only courses that clearly fall into it, but also a number of courses that are at least somewhat related. The lists do not set out the courses in the order in which they should be taken; students should examine the current course schedule to ascertain which courses have prerequisites, also consult with the faculty members and associate and assistant deans for guidance. Students need not (and seldom do) take every course listed in a particular subject area. Instead, students should determine if an individual course is of interest to them, and whether it will further their educational and professional goals. For more detailed information about specific courses, students should consult individual course descriptions and, again, consult with faculty and appropriate administrators. A semester pursuing external studies at a government or nonprofit office. Up to six credits of independent research under the supervision of a faculty member. Two students may work cooperatively on a project and groups of students may create an informal seminar or reading group as independent research. Up to twelve credits of non-law coursework which is relevant to or will contribute to the education of a lawyer, normally at the graduate level. Please consult with an assistant dean for guidance, and see the Registration Instructions for information about how to enroll. Other graduate or professional degrees concurrently with their law degree. 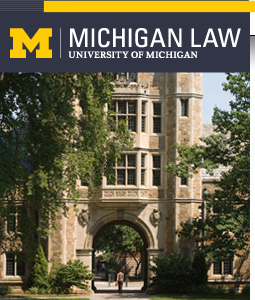 The Law School has developed several formal dual degree programs with other University of Michigan schools. Dozens of student organizations, six scholarly journals, and other extracurricular opportunities spanning many subject areas. Please see the Student Handbook for information about other opportunities. Finally, every year in March, the Office of Student Life puts together a Course Advising Series. Faculty members and administrators participate in panel discussions designed to provide students interested in particular areas of law with insights on choosing their upper-level courses and extracurricular pursuits.